This article is about the disease Vampirism, in particular the effects it has on the player. For NPCs who are vampires, see Vampire. Vampirism in Skyrim is a disease that transforms players infected with Sanguinare Vampiris into vampires: feared, blood-drinking creatures of the night. If the Dawnguard add-on is installed, and you have been granted vampirism from Serana or Lord Harkon, you will be able to transform into a powerful Vampire Lord with a lesser power. Sanguinare Vampiris is contracted from encounters with vampires: whenever a vampire casts Vampiric Drain on you, there is a 10% chance for you to be infected with the disease. Initially, this is a normal disease that reduces your total health by 25 points and can be easily cured with a potion of Cure Disease, a Vigilant of Stendarr, or by visiting a shrine. At sunrise of the first day after contracting Sanguinare Vampiris, a message will appear saying "You feel strangely weakened by the sunrise". At sunset of that day, "You feel a strange thirst come over you". If the disease is not cured within three days, it will progress to full vampirism, and the effects can no longer be reversed with a normal cure (see below). If Dawnguard is installed, you can also gain vampirism by letting Lord Harkon infect you during the Bloodline quest. Alternatively, you can activate the Bloodspring in Redwater Den or let Serana infect you, either at the end of the Chasing Echoes quest or after the core Dawnguard questline is complete. Vampirism takes a toll on its victims' appearances; when a human or elf becomes a vampire, their eyes become black with reddish irises, their skin pales, they grow fangs, and their faces become gaunt. Argonians and Khajiit eyes will have slitted pupils upon transformation. Argonians will have two sets of fangs, and Khajiit will have fangs like a sabre cat. Argonians and Khajiit will have paler scales and fur. With Dawnguard installed, vampire eyes will glow yellow-orange. Some vampire faces also appear more "bat-like" or monstrous, with a slit running through their lip and a bat-like nose. Argonian and Khajiit vampires look the same with or without Dawnguard. Vampires are hated and feared by the general population and stage four vampires will be attacked on sight. The four major joinable factions will not be hostile toward stage four vampires so long as you join before you reach stage four and are not caught feeding on any of their members. With Dawnguard installed, NPCs will only attack you if you are in Vampire Lord form. Full vampirism is made up of four distinct stages, starting at stage one and progressing to stage four. You advance one stage for every 24 hours you go without feeding on a sleeping NPC. Feeding always returns you to stage one. As a vampire, you will experience both beneficial and detrimental changes depending on your current stage. The longer you go without blood, the more extreme these changes will become. In addition, as you progress through the stages you gain several unique powers and spells, some of which will grow more powerful with each stage. Returning to stage one will remove the higher level powers and reset the remaining ones to their original strength. A permanent active effect you gain from stage one onward that increases the potency of your Illusion spells by 25%. A permanent active effect you gain from stage one onward that makes you 25% harder to detect while sneaking. While outside during the day, health, magicka, and stamina are reduced, and the regeneration for each of these stats is reduced by 100%. The reduction increases with each stage of vampirism, as indicated in the table above. Day begins at 5am and ends at 7pm regardless of the visibility of the sun. Vampiric Drain is a unique Novice Destruction spell that continuously absorbs a small amount of health from a single target and adds it to your own. While Vampiric Drain can be dual-cast with the corresponding Destruction skill perk, its cost is not reduced by any Destruction proficiency perks and using it does not train your Destruction skill. However, equipment and apparel reducing Destruction skill costs will still have effect, making it possible to cast Vampiric Drain for free. Unfortunately, this spell is not as powerful as the version cast by vampire NPCs (which can reach up to over 20 HP per second), but it can be useful to damage an enemy while healing yourself, especially at lower levels, avoiding the inconvenience of having to switch to individual spells. If Dawnguard is installed, Vampiric Drain can drain health, magicka, and stamina from the target if a Volkihar optional quest is completed and the Bloodstone Chalice is used. Stage 1: Drains 2 health per second. Costs 6 magicka per second. Stage 2: Drains 3 health per second. Costs 10 magicka per second. Stage 3: Drains 4 health per second. Costs 13 magicka per second. Stage 4: Drains 5 health per second. Costs 17 magicka per second. This power allows you to reanimate a dead body to fight for you for one minute, once per day. It increases in power with every stage of vampirism. Note that servants raised with this power may not always disintegrate to ash as with the standard Conjuration spells (they retain normal form when the timer runs out, but if they are killed in combat, or if you fast travel/change instance, they will disintegrate). Stage 1: Reanimate a weak dead body for 60 seconds. Stage 2: Reanimate an average dead body for 60 seconds. Stage 3: Reanimate a strong dead body for 60 seconds. Stage 4: Reanimate a very strong dead body for 60 seconds. Vampire's Sight is a lesser power giving you Night Eye for 60 seconds. This power is similar to the Calm spell and can be used once a day. Once the Dawnguard add-on is installed, Vampire's Seduction will allow you to feed on NPCs at any time, regardless of whether they are sleeping. If you do not possess this power during the vampire version of the quest ProphetDG, you will temporarily receive it in order to enthrall Dexion Evicus, only to have it disappear after use. Embrace of Shadows is a power similar to the Invisibility spell that can be used once per day. While this power is active, you will be invisible and have Night Eye for 180 seconds. Interacting with the environment or attacking will make you visible again. In order to remain at, or return to, the first stage of vampirism, you must feed on a sleeping NPC. To do this press "Use" while crouching or standing over them and select "Feed". Feeding should be done with caution, as witnesses will immediately become hostile. You can feed on almost any NPC that sleeps in a bed, including all races and even ghosts and other vampires, but not children. A sleeping NPC may become hostile if they wake while feeding and detect one of your followers. This can be avoided by having your follower wait outside or providing them with a muffle enchantment. The most effective and safe way to feed is to use an Invisibility effect from either a potion, spell, or the Embrace of Shadows ability, since feeding is one of the few actions that does not cancel the effect. Followers can be fed on with total impunity, so long as there are no other witnesses. The Vampire Cattle (DG) are free to use for feeding. If you contract Sanguinare Vampiris during battle with a vampire, you won't become a vampire yourself for three days. Until then, you can rid yourself of the disease with a Cure Disease potion or any blessing. After the first three days of infection, or if you obtained your vampirism from Lord Harkon or Serana, the task of finding a cure becomes more complex. While visiting any inn, talk to the innkeeper and he or she will send you to Morthal to speak to a man named Falion. This will start the quest Rising at Dawn. However, if you are in the last stage of vampirism (and do not have Dawnguard installed), the innkeepers may attack you on sight, so you may need to feed in order to lessen the effects of your vampirism, making NPCs friendly again. You can also cure your vampirism by becoming a werewolf through the Companions faction. However, once you contract lycanthropy, you gain a 100% resistance to disease and cannot be re-infected with Sanguinare Vampiris by normal means while a werewolf. With Dawnguard installed, if you were previously a werewolf at some point prior to becoming a vampire, then you can ask Aela to restore your lycanthropy once, which will cure your vampirism (by making you into a werewolf). You can obtain Auriel's Bow through the Dawnguard questline to block out the sun and counter its effects. Vampirism and lycanthropy cannot co-exist in Skyrim; one cannot be both a werewolf and a vampire at the same time. After becoming a werewolf, a vampire is cured of Sanguinare Vampiris. Because lycanthropy provides total disease immunity, this prevents you from becoming infected with Sanguinare Vampiris while the Beast Blood ability is present. Note that you can, however, cure lycanthropy (just as you can cure vampirism), so you will be able to become a vampire again should you choose to forgo your Beast Blood. Becoming a vampire will flag you as undead, so the effects of the Restoration perk Necromage will affect you too. Shouts, spells, and equipment will all receive boosts to their magnitudes (25% to power and 50% to duration). Taking the Necromage perk before taking both Atronach Perk and Atronach Stone can give you a permanent 100% Spell Absorption, thus making you immune to all spells affected by Spell Absorption. Curing vampirism after obtaining the Necromage perk does not remove these bonuses, nor does it remove bonuses to enchantments, as long as they are not unequipped afterwards. The following perks will also receive a 25% bonus to their power: Steady Hand, Power Shot, Quick Shot, Fists of Steel, Quick Reflexes, Dual Flurry, Wind Walker, Muffled Movement, Extra Pockets, Recovery, Avoid Death, Magic Resistance, Atronach. 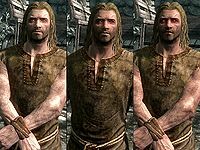 This issue has been addressed by version 1.2.3 of the Unofficial Skyrim Patch; Necromage no longer boosts the power of perks, spells, and enchantments used on a vampire player. Necromage also increases Health, magicka and stamina reduction penalties by 25%, thus increasing stage 4 vampire stat reductions to 75. This effect will first take place only after reverting from Vampire Lord form. With the vampiric power Champion of the Night, you can effectively raise the cap for Illusion spells to over level 70, provided you have all relevant perks and the spell is dual-cast. This can make almost every opponent susceptible to Calm, Fear, and Fury spells. Note that Master level Illusion spells do not gain the power increase of dual-casting, and therefore will not affect higher level enemies. Though vampirism gives 100% resistance to poison, the actual poison resistance is capped at 85% and will not protect you from the poison gas in Calcelmo's Laboratory (the poison damage is scripted and cannot be resisted). Drinking the blood of an NPC that you know to be a werewolf will not infect you with lycanthropy and does not provide you with any special benefits. If you are a vampire and have Hearthfire installed, you can add a coffin to use for sleeping in the cellar of Heljarchen Hall, Lakeview Manor, and Windstad Manor. Vampirism is considered an individual race in the game. It is evidently visible when an NPC would comment based on the player's race, would not choose the correct racial option. Examples are: Bolund in Falkreath and Vulwulf Snow-Shod in Riften. They will think the player is not a Nord if he/she is a Nord Vampire. Master of the Mind is also used by the Vampire's Seduction calm effect. At stage three of vampirism, the stunted regeneration effect while in sunlight has a magnitude of 75%, even though all other stages have a magnitude of 100%. The fix was reverted by Dawnguard; with the add-on installed, your health, magicka, and stamina regeneration are damaged only 75% at stage three vampirism. When playing as a female vampire, quitting the game and reloading the vampire save can result in a burnt or dirty face effect that does not go away on its own. The visual bug is different than the normal facial changes that occur when becoming a vampire. If the problem has already occurred to you and a return to a save game is not possible, it can be corrected with the following procedure. Finish the Rising at Dawn quest to cure vampirism and become a normal human. Go to the Face Sculptor in Riften to edit your character's appearance. The Face Sculptor will not operate on vampires, which is why you must become human first. In the customization screen, disable the Eye Shadow by pushing the slider all the way to the left. Become a vampire again through any of the normal methods. Note that if you have already joined the Volkihar vampires, you will not be able to rejoin them after becoming human again. This can also be done through console commands so the player doesn't have to leave Volkihar Vampies. To become human use 'player.setrace Xrace' (replace X with whatever race the player is e.g. nordrace). Use 'showracemenu' to remove the eye liner. Attempting to feed on an NPC sleeping in a bed with something next to it (such as a table or chest) can cause the feeding sequence to not animate correctly. The screen will still glow red and you will revert to stage one vampirism, but your character will be stuck in place, unable to move. Becoming a vampire will reset your skin tone to the default for your race. Both ebony and Blades shields become invisible when equipped as a vampire. Nords will not get the glowing yellow eyes that all other races get when becoming a vampire after Dawnguard is installed; they instead get a glowing version of their old vampire eyes. Khajiit will not get the glowing yellow eyes that the other races get when becoming a vampire after Dawnguard has been installed. Their appearance remains that of a regular Khajiit vampire: pinkish eyes, light fur, and saber cat-like fangs. Sometimes if you drink a potion of blood, which can be obtained if you side with the vampires during the Dawnguard questline, you turn into a stage four vampire. ? As a vampire, you may be unable to feed off NPCs affected by the Vampire's Seduction power in Dawnguard; clicking "Feed" has no effect. While a vampire, sometimes wearing the Blackguard's Hood, Thieves Guild Hood, or Guild Master's hood makes the top of your head bald and the hood doesn't show. This enables vampires to equip those hoods together with other headgear. A vampire can thus wear up to three pieces of headgear simultaneously: the Thieves Guild or Guild Master's hood; any circlet or dragon priest mask; and a Penitus Oculatus helmet, Falmer helmet, or the Jagged Crown. Note that version 1.2 of the Unofficial Skyrim Patch will prevent you from wearing circlets or dragon priest masks with other headgear. Sometimes, you will be made a vampire and have all the effects, but the game will not recognize it and you will be unable to feed or cure vampirism. To fix this, use the console command player.setrace [playerrace]racevampire (e.g., player.setrace highelfracevampire). It may be possible to cure yourself by becoming a vampire lord or werewolf. Simply being a werewolf will not prevent you from contracting this bugged version of vampirism. A Necklace of Disease Immunity (with 100% immunity bonus) will, however, prevent it. Falion's cure when applied to Volkihar vampires does not set their faction (xx003376) to -1. As a result any NPCs remaining in Fort Dawnguard will attack on sight even though you have been "cured" of vampirism. ? To fix this, use the console command addfac xx003376 -1. For more information about vampirism in the Elder Scrolls universe, see the lore article. This page was last modified on 24 February 2019, at 04:15.